Danya started her professional working career early. At age 14, she worked part-time at her Dad’s CPA firm where she assembled income tax returns, performed office functions and helped with the marketing and advertising needs of the company. After graduating from Buena High School, she attended college and graduated from California State University at Northridge with a degree in Multimedia Management. With her prior experience, proficiency and education, she joined the company full-time. Her present title is Client Happiness and Relationship Manager (CHARM for short). 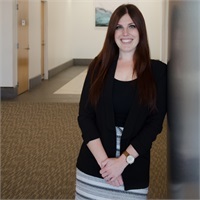 Since joining Carey & Hanna, she attended and graduated from a Tax Preparer’s course, has become a licensed Notary Public, completed her Master’s Degree in Accountancy in November 2017 and is currently studying to sit for the CPA exam. Her duties have been to continue with her office functions while being the special event coordinator. Recently, she organized and supervised the Carey & Hanna Annual Charity Golf Tournament which raised more money for the Loeys-Dietz Foundation than any other Carey & Hanna charity event! In her off time, she resides in Thousand Oaks with her husband, Ryan, owns and rides her own horse, and enjoys her dog, Tigger. She has won numerous riding awards including the Simi Valley 2010 Grand Year End Champion on her horse Kootenai. She also owns her own photography company and contracts to photograph weddings, special events and personal photos of her clients. She is a member of WPPI-Wedding Portrait Photographers International.